The iconic symbol of the Dragon Ball universe! Beautiful, articulated Shenron action figure. Perfectly detailed, it measures about 11-inches tall. The iconic symbol of the Dragon Ball universe joins the SH Figuarts series as this beautiful, articulated Dragon Ball Z Shenron SH Figuarts Action Figure. 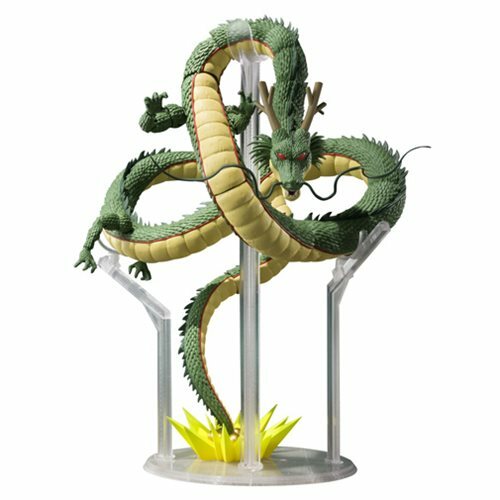 Measuring about 11-inches tall, it perfectly captures Shenron's details, from the whiskers down to your ability to achieve dramatic undulating poses! The Dragon Ball Z Shenron SH Figuarts Action Figure includes a stand. Ages 15 and up.